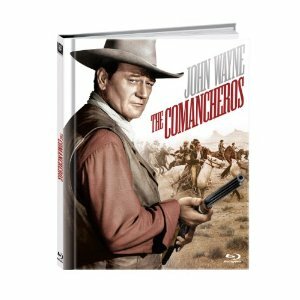 Between the success of The Searchers and the award-winning performance of True Grit, John Wayne made The Comancheros. This buddy western co-stars Stuart Whitman as Paul Regret, a gentleman who makes the mistake of dueling with the son of a powerful political figure in town. Forced to flee, regret is hunted down by Texas Ranger Jake Cutter (Wayne). Although there are many expected moments in the film, the narrative is quite untraditional. Regret is not the bad guy, despite being the one that Cutter is hunting for much of the film. After they spend some time disagreeing with each other, Cutter and Regret are forced to fight off an Indian gang together, building a friendship along the way. The Comancheros is also the final film of Michael Curtiz, a legendary director by any standards. Unable to finish the film, Wayne took over some of the responsibilities near the end of filming, and Curtiz was unable to make it to the release of his final film. The Comancherso is yet another example of how diverse a filmmaker Curtiz was, able to make a compelling film in any genre. The Blu-ray book includes 24 pages of production photos, essays and cast/crew bios. The special features on the disc include an audio commentary with Stuart Whitman, Nehemiah Persoff, Michael Ansara and Patrick Wayne. There is also a two-part documentary about the films Wayne made at Fox Studios, a few featurettes, an audio-only interview with Whitman and a gallery of a vintage comic book. It is an impressive collection of features, along with a high definition presentation of the black-and-white classic.